Injured in Automobile Accident that Wasn’t Your Fault? If you or your loved one has been in an automobile accident we can help. If injuries or death have occurred as a result of an accident the best practice is to consider hiring a trained professional rather than trying to handle claims on your own for one simple reason: the insurance company will most certainly be consulting with its lawyers. For more information, please read Injured in an Auto Accident? Insurance companies are notorious for looking out for their bottom dollar, and not your best interest. We have extensive experience understanding the “mindset” of insurance company claim representatives and defense lawyers because our lawyers have worked for many insurance companies prior to devoting their full time and attention to representing injured victims. Did you know that as a victim of an accident you are often eligible for compensation for lost time at work, pain and suffering, medical bills and compensation for long term disabilities? In certain circumstances your spouse may also be eligible and recover for a loss of consortium claim. *Obtain the other driver’s identification and insurance information. • If you or your passenger is injured, obtain immediate medical treatment. • Insist on a police investigation and report. • Obtain eye witnesses contact information. • Take photos of your damaged vehicle and visible injuries such as bruises and or cuts. • Report your loss to your insurance company, but do not give a statement to the other driver’s insurance adjuster. • If seriously injured, do not try and settle your own claim. 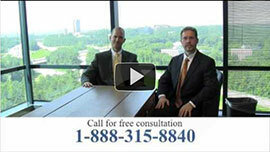 Our injury lawyers offer FREE, no obligation consultations with accident victims. Consulting with an Atlanta injury lawyer will benefit you and will not in any way obligate you to utilize our services. If you decide to hire an injury lawyer he or she can help you make the best and right decisions after an auto accident, bus accident, tractor trailer accident or commercial vehicle accident. We will guide you in taking the right actions needed to gather evidence from the accident and to establish a solid case to take to court. The Georgia statute of limitations for personal injury states that any victim of an auto accident can file a claim up to two (2) years after the accident which is also known as the date of loss. Cell phones have drastically increased the risk of being in a car accident. People who use their cell phones while they drive have a slower reaction time than those who don’t. Our two lawyers have combined forty (40) years of experience assisting clients who have been involved in auto collisions and suffered injuries from those collisions. We are happy to leverage our knowledge to the benefit or our previous and new clients. The Law Firm of Link & Smith, P.C. specializes in Personal Injury Accidents. We focus our practice on assisting victims of negligence who have been seriously injured or have been the victims of wrongful death. By keeping this tight focus and by not handling other types of cases such as wills, trusts, estates, criminal defense or family law we are able to best serve our personal injury clients. Contact us today to get the settlement you deserve. We believe that serious injuries deserve superior results.